There are many free services at Inasmuch. These are basic resources for those in need. We do not take government funding, so all of these resources are funded by private donors and carried out by volunteers. We are thankful for their love and support! Our goal is to share God’s love in a tangible way. We hope they get to know Jesus, secure a job and find a home. 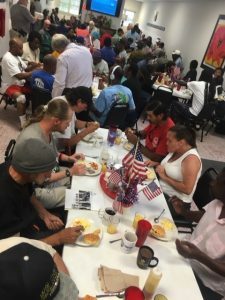 The weekday breakfast program is our main ministry to the homeless and struggling. Each morning, we meet people who come for a meal but who also hunger for fellowship and a relationship with The Lord. A hot, nourishing breakfast is just the beginning. There is also live music, a devotion, announcements of services and local events addressing the needs of the homeless. And, we couldn’t do it without the loving fellowship of our amazing volunteer teams!